Leslie has been a cat lover all of her life. Her dream as a little girl was to have a place where she could save animals… specifically cats. Leslie has been a vet tech assistant for a cats only veterinary hospital and a volunteer for several local cat rescues including Ventura County Animal Services. Leslie is a Certified Feline Behavior and Training Specialist skilled in assessing cat behavior, rehabilitation from stress induced behavioral problems, Tiny Lion kitten socialization and cat wrangling. On the rare occation Leslie is not at Surfcat you can find her with a feather wand on her Catio at home with her own clowder. Walking, kayaking and boating fill up the spaces. Roxanne (“Rox”) puts the “surf” in Surfcat Cafe & Adoptions. A diehard surfer and animal lover, Rox has been graced with the company of cats all of her life. When she is not shredding waves at the local breaks, Rox teaches U.S. History, World History, and physical education, at the middle school level. Rox got involved with cat rescue, fostering, and adoptions, through her BFF and roomie Leslie. Rox has sometimes been called the “cat whisperer”, as even the most frightened feline eventually warms up to her. Rox is also Surfcat Cafe & Adoption’s artist in residence, chief writer, and reality checker. Phillip is a California boy, born in Ojai, who found his way to Hawaii and graduated from Wayland Baptist University on Oahu with a degree in management. After an extensive stint in the U.S. Navy where he earned the rank of Master Chief Petty Officer, and deployed to both Iraq and the Horn of Africa Phillip is now working as a Family Office Manager and Butler (yes…a Butler!). Phillip’s management skills and experience working with non-profit organizations in the islands are an indispensible asset to Surfcat! Michelle has loved kitties since she was a little girl and was rarely without a feline companion in her life. A lover of all things living, she often found herself rescuing and rehabilitating all sorts of critters from birds to rabbits, possum, raccoons, dogs and cats. A compassionate person, she devoted her professional life to caring for the elderly and people with disabilities and special needs. She is now looking forward to helping build Surfcat, bringing her enthusiasm, organizational skills and creativity. 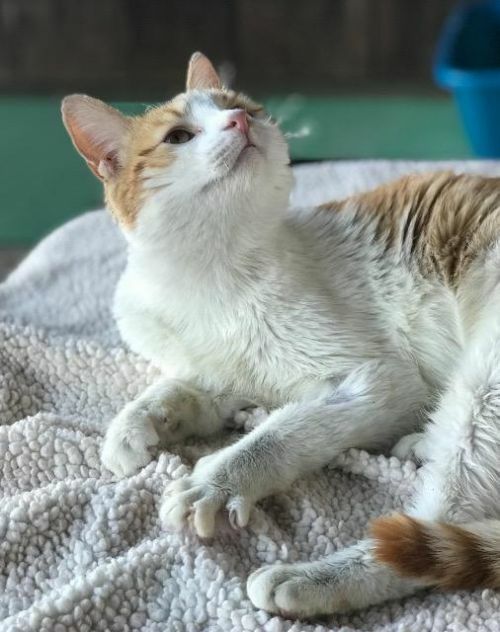 It will be a natural transition for Michelle to focus her energy on our senior cats and cats with disabilities program, evaluating the special needs of cats and helping to find them forever homes where they can live in comfort and with love. With over twenty years in the accounting and finance industries, Joy brings a wealth of knowledge and experience to Surfcat Café & Adoptions. During her career, Joy has provided accounting services to both public clients and private industry. From small start-ups to billion dollar corporations, Joy has always met and exceeded expectations. Joy is a Southern California native who moved to Ventura County after growing up in the San Fernando Valley. Always a cat lover, Joy has owned cats her entire life. Currently, Joy is nurturing Sir Lancelot, a beautiful long haired male kitty who was rescued by Surfcat from the Ventura County Animal Shelter. Lance is a senior special-needs feline with a variety of ailments including a herniated disc in his spine. When not entertaining Lance, Joy devotes her time as the President of JC Accounting & Tax Services, aka JCATS, providing accounting, business and tax services to small and medium businesses in the LA-Ventura-Santa Barbara county metro areas. As part of her business model, Joy made a decision to provide pro bono accounting services to a few nonprofit organizations; Surfcat Café & Adoptions is among them. Joy has found that providing accounting services to Surfcat Café & Adoptions has been one of the most rewarding experiences of her career. This organization represents a cause that Joy truly believes in and provides the amazing benefit of being surrounded by the grateful and loving rescued kitties who help to participate in the board meetings. With over 14 years of professional experience working in various roles at nonprofit organizations and pet care businesses, Chelsea brings a broad set of skills to Surfcat. For the past six years she has served as Executive Director of a local nonprofit promoting access to alternative medicine. Before moving to California from the east coast, Chelsea managed the IDEA (International Design Excellence Awards) Program, sponsored by Fast Company. After gaining intimate exposure to the world’s best designs and design thinkers, she left DC and headed to California to work for a design consultancy. In 2001 she successfully launched and later sold an in-home pet care service, Ready Pet Go. Chelsea has regularly volunteered with animal rescue groups wherever she’s lived. As newly-named board member, she is busy brainstorming creative new ways for Surfcat to reach its financial goals. She’s also helping revamp the org’s website to take full potential of new tools to streamline administration tasks so we can all spend more time playing with the kitties. In her free time, she makes videos of her rescue cats Harlow and Zappa grooming each other, and takes her dogs Jeremy & Carlos for adventure hikes. She’s also a foster for a rotating crew of Surfcats!